Contra Costa Regional Medical Center & Health Centers has been recognized many times for its high quality and innovative work through the years. 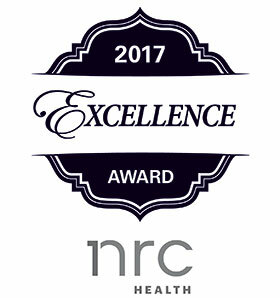 In 2017, Contra Costa Regional Medical Center received an NRC Health Excellence Award, which recognizes healthcare organizations for the high satisfaction ratings they get from their patients. CCRMC was honored by NRC Health, a national firm that measures patient satisfaction at healthcare facilities around the country, for being one of the most improved facilities for medium-sized hospitals. Top 10 Family Medicine Residency in the U.S. The Contra Costa Family Medicine Residency Program was recognized as a top-10 residency program by Doximity in 2015, 2016 and 2018. The popular program receives more than 800 applications every year for 13 residency slots. 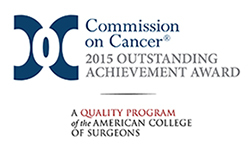 Our cancer program received the Outstanding Achievement Award from the American College of Surgeons' Commission on Cancer in 2009 and 2015. CCRMC was the only hospital in California to win the prestigious award for the survey period covering the first half of 2015. Advanced Access Initiative (2015): The initiative incorporated a series of improvements using a team-care approach to enhance patients' access to care. The judges said the advanced access effort "stood apart because it addresses a significant health care challenge and meaningfully impacts patients' experience and quality of care." Telephone Consultation Clinic (2013): Through the telephone consultation clinic (TCC), advice nurses connect callers to on-duty doctors for a phone consult. About 75% of patients who are referred to the TCC have their needs met without an in-person visit. In its first year, the TCC enjoyed a 98.5% patient satisfaction rate. Reducing Repeat Casarean Sections (2011): CCRMC was honored for its program to help women have natural child birth even if they had previously had a C-section. CCRMC was one of only 12 hospitals recognized nationwide in 2014 as an exemplar hospital by the Institute for Patient- and Family-Centered Care. IPFCC hailed CCRMC for eliminating restrictive visiting hours and replacing them with a 24-hour welcoming policy. The California Breastfeeding Coalition (CBC) recognized our breastfeeding task force in 2016 for establishing six new outpatient lactation clinics to help moms breastfeed their babies. Tracking data show that mothers who give birth at CCRMC are exclusively breastfeeding their babies for longer since the lactation support program was launched. In 2013, our West County Health Center won the Green Building Award for new construction from Sustainable Contra Costa, a local nonprofit that provides education about how to implement sustainable practices. 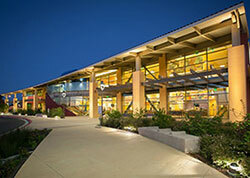 Sustainable Contra Costa recognized the LEED-certified health center for being designed and constructed in a way that greatly conserves water and energy.